What will be easy to see at Edmonton’s Pine Creek Manor is that the apartments are designed for the middle-income renter market, with amenities including air conditioning and granite counter tops. What won’t be apparent is that Pine Creek Manor is actually an audacious experiment, a first-of-its kind 50-50 partnership between builder RMS Group and Edmonton’s Capital Region Housing Corporation, an agency formed under the Alberta Housing Act to provide affordable housing. Most of the units in the two-building, $35-million project in the Jackson Heights neighbourhood in Edmonton’s Mill Woods area will be two-bedroom, aimed at families or individuals with roommates. They won’t appear much different from those in RMS Group’s similar buildings. What will be different is that, of the 174 units in the two buildings, 35 will be subsidized housing for lower-income renters. But these apartments won’t carry the stigma that sometimes goes along with so-called subsidized housing. 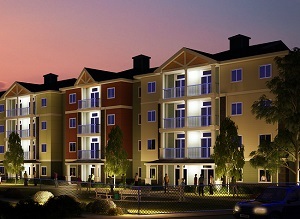 “The project is planned, designed and built as market housing. If someone were to move into one of the units they would have no idea which ones are subsidized,” says RMS president Curtis Way. And the units themselves aren’t permanently earmarked as subsidy housing. The plan allows recipients of subsidies who move into higher-income groups to continue living in their units when their financial situation improves, rather than be forced to move out of a fully subsidized building. “If someone gets a better job, can pay market rent, they don’t have to leave. The next unit down the hall may be subsidized” to continue filling the need, says Way. Because the project will be owned 50-50 by RMS and the housing agency, it also gives a unique opportunity to Edmonton Capital Region Housing to make some income from the non-subsidized units. This will help offset the cost of the subsidies. Greg Dewling, CEO of Capital Region Housing, says the agency is striving to make all its new projects sustainable and this partnership with RMS meets those goals. RMS’s involvement in the partnership grew from Way’s participation on a City of Edmonton committee on social housing. The challenge is large, says Way, with 6,000 families requiring housing. “That’s not going to be handled just by government,” says Way. Shovels for the project went into the ground in August. Pine Creek’s subsidized tenants will be paying rent about 20 per cent lower than market rate, says Dewling. For a two-bedroom apartment that would normally cost about $1,400, they will pay about $1,120. Way and Dewling won’t go into detail about how the finances break down in the partnership to cover the subsidization factor. Way says RMS won’t lose money, but being in partnership with a government agency means it is unlikely the building could be sold in the future. “We understand we are in this for the long term. My children and grandchildren might still own this 20, 30, 40 years from now,” Way says. “We know the dollars and cents of this project will work. The partnership is a pilot effort. Dewling says his agency has had initial conversations with at least a dozen other companies interested in monitoring Pine Creek Manor’s success. Way says RMS would also be interested in similar projects in the future. Way says his firm has an advantage when doing this type of project because RMS covers all phases of development from raw land to building and property management. The family-owned firm has built apartment and commercial buildings and hotel projects throughout Western Canada, and has been notable for its phenomenal rate of growth. For two years, in 2015 and 2016, the Edmonton-based builder popped up on the Canadian Business Profit 500 rankings as the second-fastest growing company in Canada. Way admits this past year the economy softened quite a bit. RMS missed the deadline to submit its figures for the Canadian Business rankings this year, says Way. But 2018 will be a remarkable year, he predicts, with more jobs than ever underway for the 20-year-old business. Way says RMS has 283 apartment units currently under construction which it will own and manage, plus another 166 units slated to start early in 2018. In addition, RMS is building 230 apartment units in Saskatoon for a third party and will start an additional 100 units in Edmonton in April 2018. RMS is also involved in a project to convert six floors of the Financial Building, an office building in Edmonton’s government district, to residential apartments.